This store should be your first stop when visiting Clarksdale. Owner Roger Stole is the concierge of all things blues, a walking encyclopedia and calendar of events. 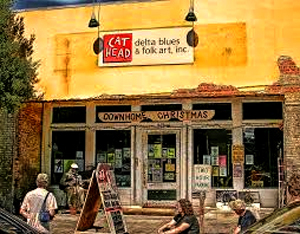 The Cat Head store is jam packed with CDs, DVDs, Books, T shirts, Caps, one-of-a-kind folk art that eradicates the border between music and art. 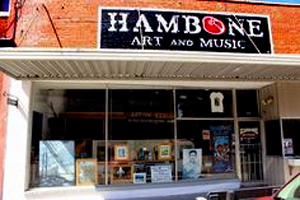 Open since 2005, Hambone Gallery is an inviting space located in historic downtown Clarksdale owned and operated by artist and musician Stan Street. This venue is both unique and welcoming to art lovers, artists, musicians, and storytellers from around the globe. Cajun chefs, bluesmen and red-haired women people the art of Stan Street. On his canvas, New Orleans’s Delta and Florida’s Big Cypress Swamp blend into a stew of red hot licks and blazing notes. 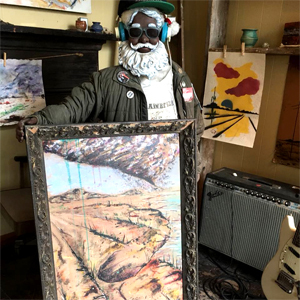 Street’s earliest art celebrated the blues pioneers in wide slashes of brilliant color on slabs of discarded wood, rescued from anonymity with portraits of the likes of Muddy Waters, Elmore James, Robert Johnson. Bold strokes and colors play out the sounds he hears and plays as a musical artist.